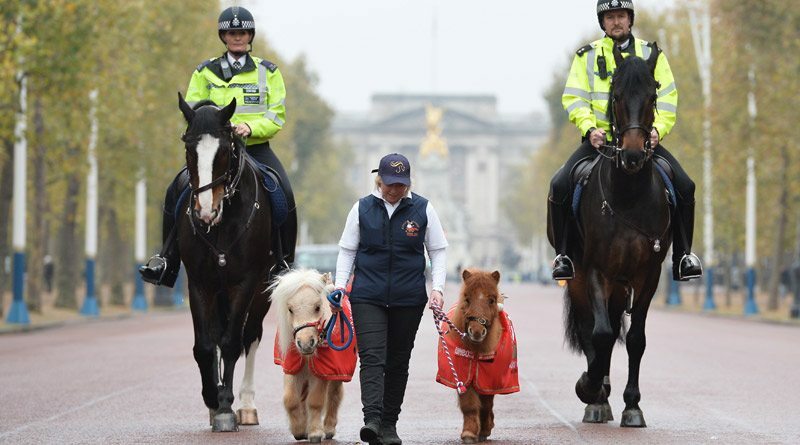 The long and short of it: Metropolitan Police Horses Merlin and Quixote were joined on patrol in central London by some special helpers, Teddy and Doris, ahead of their appearances at Olympia, the London International Horse Show next month. Two shetland ponies have done a turn on patrol with the Mounted Branch of Metropolitan Police in London, keeping up with their much larger colleagues on the beat. The pair are popular mascots with Olympia’s official charity, Hannah’s Willberry Wonder Pony, and Doris and Teddy will be joining the police horses in the MPS Police Activity Ride at Olympia, the London International Horse Show next month. Stepping onto the Mall, one of London’s most iconic locations, Teddy and Doris lined up with Police Horses Merlin and Quixote and despite the noticeable size difference, the tiny pair just about kept up as the steady Police horses took them under their wing as they walked side-by-side towards Buckingham Palace. Instagram sensation Teddy the shetland’s owner, Alice Goring, also the charity’s Scientific Advisor, said it was the first time Teddy and Doris had been to London. “It is great they could familiarise themselves before Olympia Horse Show starts in December. The charity was founded by the late Hannah Francis, a successful young event rider, when she was diagnosed with a rare bone cancer. The charity aims to support research into osteosarcoma, together with granting Willberry’s Wishes to seriously ill people with the aim of enriching their lives through equestrian experiences. Hannah was so touched by the generosity of many in the equestrian world who allowed her to do likewise and was determined to be able to do the same for others. The Activity Ride demonstrates the day-to-day training routine ahead of patrolling the busy streets of London, carrying on a proud tradition of service and duty which began in 1873, when horses were hired from a local livery stable for use in emergencies. Olympia runs from December 12 to 18.